More than 25 highly skilled young stockpeople from across the UK will battle it out for the title of Young Stockperson of the Year at the East of England Smithfield Festival, Peterborough on 30 November and 1 December. The competition, sponsored by the NFU's Peterborough office, will combine a test of the entrants' cattle handling and showing skills with their livestock knowledge in areas such as feeding, breeding and general management is in its second year following a highly successful debut last year. Split in to two age groups, intermediates aged 15- 17 years and seniors aged 18 – 21 years, the finalists have all qualified at summer agricultural shows across all corners of the UK. Judging the competition this year will be well know cattle breeder Gayle Bersey, Cornwall, an Aberdeen-Angus breeder and coordinator of the Aberdeen-Angus Cattle Society's Youth Development Programme. 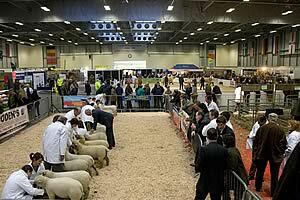 Kerry Buttriss, agricultural manager with the East of England Agricultural Society said the competition was designed to reward young people with a keen interest in livestock. "Much has been said in recent years about the lack of young people entering the industry and this is just one way we can do something about it. "Without young, keen, qualified stock people the UK livestock industry cannot survive. No matter what their background we're keen to encourage young people to consider a career in the livestock sector and hope that this nationwide competition can be play a small part in drawing new talent to the sector." In addition to the Young Stockpersons competition the event will also host the 2012 College Challenge, a stock judging competition for teams of college students from across the UK. Teams of four students will have to judge four different classes of live and deadstock: a pen of breeding heifers, a pen of fat lambs, a pen of breeding ewes and four lamb carcasses, with each student allocated one section each to judge and give their reasons on.